On October 18, the Segal Design Institute received the Sr. Cecilia Fandel Award for Community and Economic Development from A Just Harvest, a non-profit organization in the nearby Rogers Park neighborhood of Chicago. 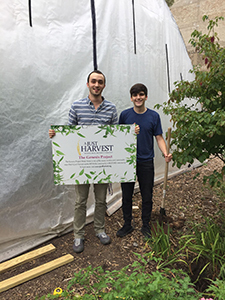 A Just Harvest chose Segal Design Institute to receive this honor because of design work completed by Northwestern Engineering students last spring and summer to improve operations at its urban farm. The students were enrolled in a course called Design Thinking and Communication (DTC), which introduces all first-year engineering students at Northwestern to the design process. Bruce Ankenman and Lisa Del Torto, co-directors of the DTC course, accepted the award on behalf of the Segal Design Institute. Peter Hoy, Director of Workforce and Economic Development at A Just Harvest, explained that the organization produces thousands of pounds of food each year as part of its work to end hunger in Rogers Park and the Chicago area. A Just Harvest operates the largest community soup kitchen in the Chicago area. "With limited growing space and financial resources for our work, we often look to community partners like Segal Design Institute to collaborate on our mutual goals," said Hoy. "It is through the sharing of our gifts that we are able to make something bigger than the sum of our parts." DTC projects for A Just Harvest included designing a composter with a lid, shelving units, irrigation, interior hoophouse beds, and signage. The work begun in DTC during the spring quarter was then continued by Segal Design Institute summer interns and Northwestern students participating in the Design for America summer studio. Hoy added, "The curiosity and thoughtfulness of the Segal Design Institute students helped us solve some longstanding problems in our hoophouse this season." Ankenman explained the powerful impact that working with A Just Harvest made upon Northwestern students. "DTC teaches students to use the human-centered design process to develop innovative technological solutions to human needs," said Ankenman. "Thirty years of living and working in Rogers Park gives A Just Harvest the knowledge and the relationships to guide our students to make a real difference in people’s lives in ten weeks. I can’t think of anything better for an introductory design class." Gavin Brehm was part of a team of DTC students who collaborated with A Just Harvest last spring. He then continued that effort as a Segal Design Institute intern project manager. Brehm described how the community-oriented mission of A Just Harvest shaped the design process for him and his classmates. "Our purpose was not only to develop products and systems that elegantly solved pain points in the operation of the hoophouse, but also to advance the mission of social and community good that underlies all of what A Just Harvest does," said Brehm. "Because of this, consideration to educational value, sustainability, and simplicity were put into the design decisions that we made along the way." Trevor Rempert was also part of a team of DTC students who worked with A Just Harvest last spring. "I’m proud of my work with A Just Harvest because we were able to construct client-friendly planting bed designs that promote green space in the community and help A Just Harvest further its humanitarian goals at the same time," said Rempert. Both Segal Design Institute and A Just Harvest envision a bright future for their partnership. "We look forward to continuing our work together to expand the impact of A Just Harvest and introduce more Northwestern students to real-life client situations," said Hoy.